Like many Germans, Berlin schoolboy Erwin Bartmann fell under the spell of the Zeitgeist cultivated by the Nazis. Convinced he was growing up in the best country in the world, he dreamt of joining the Leibstandarte, Hitler’s elite Waffen SS unit. Tall, blond, blue-eyed, and just 17-years-old, Erwin fulfilled his dream on Mayday 1941, when he gave up his apprenticeship at the Glaser bakery in Memeler Strasse and walked into the Lichterfelde barracks in Berlin as a raw, volunteer recruit. On arrival at the Eastern Front in late summer 1941, Erwin was assigned to a frontline communications squad and soon discovered that survival was a matter of luck – or the protection of a guardian angel. Good fortune finally deserted Erwin on 11 July 1943 when shrapnel sizzled through his lung during the epic Battle of Kursk-Prokhorovka. Following a period of recovery, and promotion to Unterscharführer, Erwin took up a post as machine-gun instructor with the Ausbildung und Ersatz Bataillon. 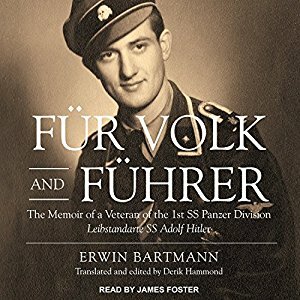 From the war on the southern sector of the Eastern Front to a bomb-shattered Berlin populated largely by old men and demoralized lonely women, this candid eyewitness account offers a unique and sometimes surprising perspective on the life of a young Leibstandarte SS Adolf Hitler volunteer.